Rory McIlroy drives on the fourth in yesterday’s second round win over Anders Hansen. 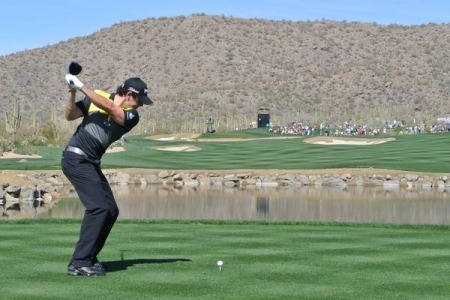 Picture Fran Caffrey/www.golffile.ieRory McIlroy is hoping the “The Mechanic” Miguel Angel Jimenez doesn’t hit top gear when they face off in the third round of the WGC-Accenture Match Play Championship at the Ritz-Carlton Golf Club later today. Bidding to win his first WGC title and become Ireland’s first world No 1, the 22-year old McIlroy knows he has a great chance of pulling it off with Tiger Woods out of the picture on his side of the draw. But he also knows that faces a tough task against the oldest and arguably the most experienced player in the field. At 48, Jimenez has a chance to break Des Smyth’s record and become the oldest winner in the history of the European Tour. And after leaning on his improved short game to beat Denmark’s Anders Hansen 3 and 2, McIlroy is well aware that he will have to fire on all cylinders if he is to see off the Spaniard and keep his hopes alive of getting to No 1 alive. 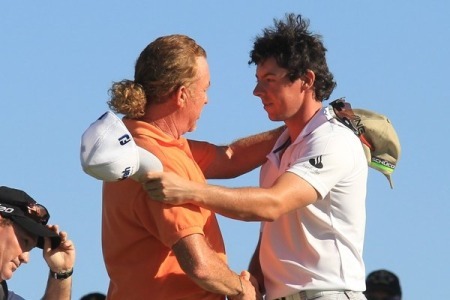 “Miguel is gritty and he obviously plays the game very differently to me,” McIlroy said. “He’s one of those guys who just hangs in there and hangs in there. “He’ll make pars and maybe a few birdies. He’s not going to light it up but he is not going to give you too many holes either. So I just feel like I have to go out there and play solid golf and hopefully that will be good enough. Jimenez might be giving up 40 yards off the tee but that didn’t prevent him from giving Martin Kaymer a match in last year’s quarter finals before eventually losing on the 18th. 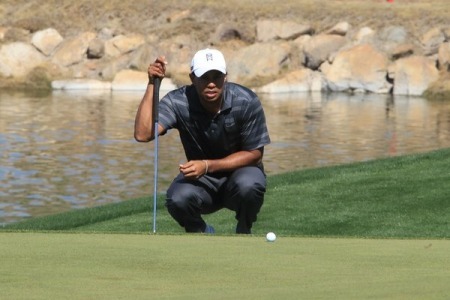 Tiger Woods on the third green. Picture Fran Caffrey/www.golffile.ieBut the cigar-chomping man from Malaga had no problem combating length as he etched out a 2 and 1 win over the huge-hitting US PGA champion Keegan Bradley in yesterday’s second round. McIlroy was not at his best against Hansen but chipped in from 10 yards on the 14th to go three up and then chipped dead from a tough position at the next to secure a vital half in birdies. Bunkered at the 16th, he splashed out to a foot to close out the match and confessed that his improved short game has given him confidence. “The short game was good and it needed to be,” he said. “It’s just something I have gradually improved and it’s something I am quite pleased about because even when I don’t play my best I can still win matches. “It’s not just this week. It was good in Abu Dhabi and Dubai as well and I was able to hang in there, which is important when you are not playing your best. The Holywood star would love to win for the third time on US soil and he confessed that the chance to become world number 1 is weighing on his mind. “Everyone keeps telling me, so it’s hard to put it out of my mind. It’s a little bit of extra motivation this week knowing that if I can get through four more matches, I could go to the top of the World Rankings which is obviously a huge moment for my career. After two rounds the event is rapidly turning into a battle for supremacy between Europe and the United States. In Ryder Cup terms, both sides have seven men in the third round with the last 16 filled out by Australian John Senden, a 6 and 5 winner over compatriot Jason Day, and South Korea’s Sang-Moon Bae. Bae beat Masters champion Charl Schwartzel 1 up and could face McIlroy in the quarter-finals if they come through their respective clashes with Senden and Jimenez. Tiger Woods’ 18th hole defeat to compatriot Nick Watney will capture all the headlines in the US today after he missed a six foot birdie chance that would have sent their match into extra holes. The former world number one also confessed that he had found the greens very difficult to read. Not so McIlroy, who said: “The greens are okay. To be honest, I feel pretty comfortable reading them. It’s not like some of the greens you get where it’s very subtle. It’s very obvious. Watney will now face Lee Westwood after the English world No 3 made it to the third round for the first time in 12 attempts. Watney has beaten Westwood in this event for the past two years and will be more than a handful for the 38-year old from Worksop, who can also get to world No 1 with a win this week. If he wins today, he will then have to see off the winner of the all Scottish affair between Martin Laird and Paul Lawrie following respective wins over Matteo Manassero and Ryo Ishikawa. 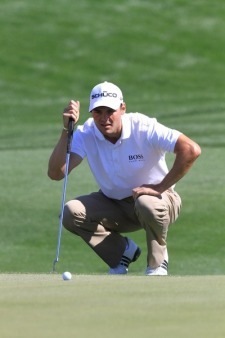 Sweden’s Peter Hanson and Germany’s Martin Kaymer were the only Europeans to survive on the other side of the draw. Hanson beat Ernie Els 5 and 4 and will now face Brandt Snedeker as Mark Wilson takes on Dustin Johnson. In the Ben Hogan bracket, Kaymer’s 2 up win over David Toms earned him a third round date with Matt Kuchar, who beat pal Bubba Watson 3 and 2. The winner of that won will take on Steve Stricker or Hunter Mahan in Saturday’s quarter-finals. Stricker holed a 20 footer at the 18th to beat Louis Oosthuizen 1 up while Mahan was unstoppable as he racked up seven birdies - including six in seven holes on the front nine - to thrash YE Yang 5 and 4. 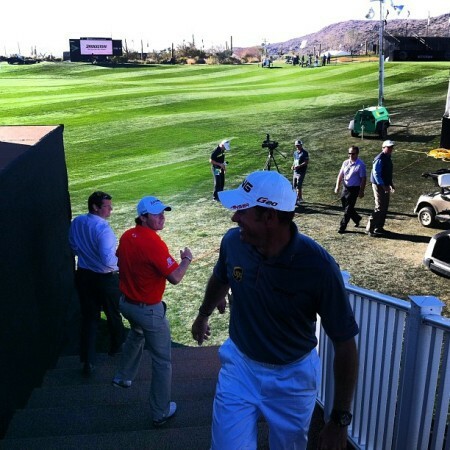 “See you tomorrow.” Rory McIlroy and Lee Westwood cross paths outside the media centre at the Ritz Carlton Golf Club near Tucson. 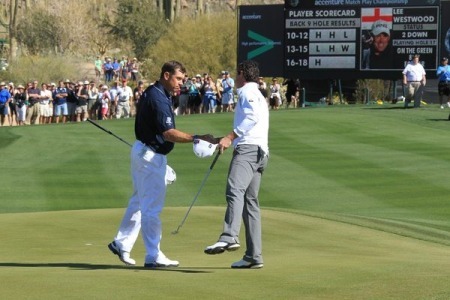 What Graeme McDowell once described as a relationship of “jokes with jabs” will get deadly serious later today when Rory McIlroy and Lee Westwood square off in the semi-finals of the WGC-Accenture Match Play Championship in Tucson.